There are immediate market niches where JPods can create profits by saving people time and money. Morgantown is a great example that can be down-sized to make more distributable and inexpensive. Below the following videos are network examples with specific paybacks listed. In general, the cost to finanance, build, operate, maintain and power these networks is about 1/10th that of oil based transportation. Turning a city into a theme park. Chicago can be networked with a dramatic cut in transportation costs. The industrial base on the western shore of Lake Michigan is very important to quickly expanding production capacity. Airport with two major physical barriers, the Ohio River and large river bluffs. Transport between downtown and the airport is often 30 minutes to an hour for an "as the crow flies" distance of about 9 miles. Chairman Oberstar indicates the scale. Novelty Network will provide good paybacks from their theme park nature. High density urban area with incredible mass transit. Yet congestion is still a major problem. Parking is expensive and difficult. The community has the political capacity to lead a major re-tooling of sustainable infrastructure. This is a 260 meter Horizontal-Elevator connecting a bus stop to the campus across a very busy parking lot. These type networks can be deployed between buildings such as in a hospital complex. Center of a large and commercially powerful beltway. Yet access within the area and to the City of Minneapolis is congested 3-8 hours per day. This is 6 miles from a major airport. It is a significant regional retail location and 6 miles from the Mall of America (a significant international retail location). Fremont, CA Warm Springs School. Fort Lee, NJ is just to the west side of the George Washington Bridge. Haiti, an application of Rescue-Rail and solar-powered mobility in a humanitarian effort. Hawaii provides an unique opportunity to integrate sustainable infrastructure into a model that can be replicated across the Pacific. Hull, MA has a long history of transportation innovation. It was to home to the first electrically powered railroad. First city to adopt the transition to solar-powered mobility. Example networks in Las Vegas, NV area. Example networks in the Lauderhill, FL area. Networking the airport economic community. Meeting both economic development and congestion goals. Private network between major industrial campuses of a single corporation. Example network for Macon, GA starting with 2nd Street Project. Solving congestion improves beach community. Letter and background on our first interest from Congress to remove the barriers to transportation central planning barriers. Similar to the Meadowlands, linking stadiums to the Convention Center will add more value to both installations. Minneapolis has experienced a larger than expected ridership on its LRT line (25,000+) riders per day. JPods can run rails radially and laterally in about 8 directions to give access to similar numbers of riders. 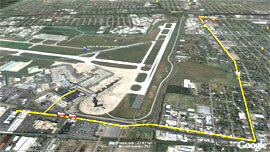 Network the economic community around the airport in stages. This will include the Mall of America, hotels on the 494 Corridor, park and rides, redevelopment in the noise abatement area of Richfield and other business, commercial and educational interests as far west as Eden Prairie. Security will be enhanced as congestion and traffic are diminished around the airport. 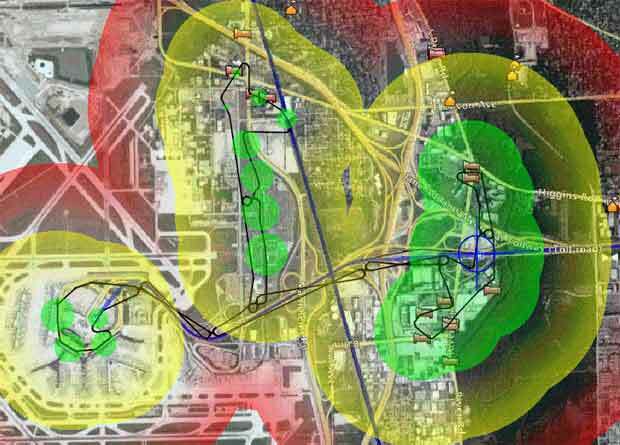 Progression of networks for the Opry, airport and downtown areas. Network at La Guardia Airport. This starts as a 2.2 mile connection between the trains and airport. Then expands to 5 miles to connect Jamaica Station. Major metro area and the capital of Canada. Wonderfully beautiful city with significant population densities arrayed across a 'green belt' of natural and agricultural land. Currently spending a $billion on Light Rail for 31 km. Great comparision that they could resolve many congestion problems and have 200 km of JPods for about the same capital costs. JPods would add to the cities revenue. Light Rail will require operational subsidies. Neighborhood vehicles already in use. Example of a 12 by 22 mile network and connection to the airport applied to the City of Sacramento. 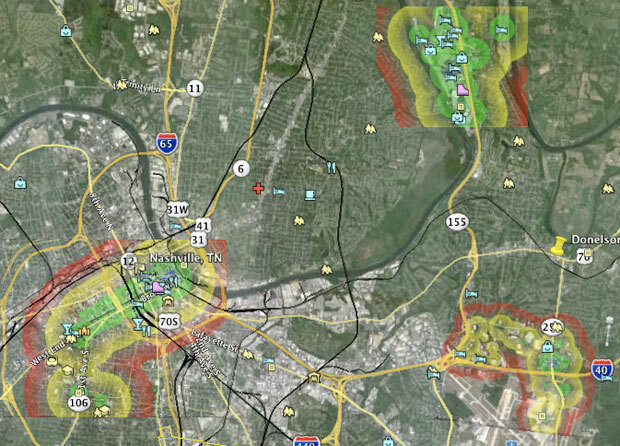 Colors note 10, 20 and 30 minutes from blue crosshair. Proposal connecting the Sandy Springs Marta Station to Cox Enterprises to Dunwoody Marta Station. Significant International airport disconnected from regional rail capacity. Parking and other access constrained by the high cost and limited real estate. The community has the capital assets, technical and intellectual capacity to lead a major re-tooling of sustainable infrastructure. Santa Cluz has requested proposals to build a network in the city. The proposal is included in this link. Proposal for reducing bus traffic and congestion along King Fahd Road. Example of a major metro area that wants to be "green" but still pours vast amounts of capital dollars into promoting oil dependency. May break from the "oil addiction' and seriously engage in sustainable infrastructure. American Dream to Secaucus Station to Manhattan. Forward thinking Souix leaders are moving their entire community into oil independence with energy use and energy production capabilities. Putting a network in the Mystic Lake complex benefits by being independent of the adminstrative road blocks to innovation. St Paul, MN will be hosting the Republican National Convention in 2008. It has little sustainable infrastructure and significant need to lead the way in demostrating the ability to end the "oil addiction". Turning a city into a theme park and tourist attraction. Examples of cadet Systems Engineering Projects of JPods for West Point. There is a carrot and stick for building solar-powered transportation networks. Carrot: About 85 cents of every dollar spent on oil can be recovered by re-tooling transportation networks as jobs, infrastructure and profits. Victory Gardens; self-reliance begins with the self. Food security is a fundamental personal responsibility. Feed-in Tariffs (FIT); allow small businesses to generate and distribute electricity. Performance Standards; grant access to transportation rights of way based on exceed a Performance Standard of 300 watt-hours per passenger-mile (114 miles per gallon). Following is a table showing a guess that we need about 1.4 millon miles of sustainable transportation networks to displace about 70% of oil-powered transport and secure the food distribution system and get people to and from work in this era of post Peak Oil. Based on riders per day, the elevator is the most successful form of public transportation. These studies and videos illustrate how Horzontal-Elevators can network and provide access between building just as elevators provide access within a building. Energy and transportation problems are so overwhelming the tendency is to look for a single quick fix. There are none and we are out of time. Severe consequences are by the most optomistic estimates 26 years away. It will take 50 years to re-tool our economies. At JPods we wake up every morning wondering if we can invent something today or rally more people to act in advance to shave a little off being at least 24 years behind unavoidable consequences. The good news we can, by working together, driving everyday, implement a process that will forge a bright future from our current state. Deployment will be executed on a first come, first served basis. Communities that grant right of way first will be the first served. Installations that are economically viable, JPods will assist in funding the network. Example networks are listed below. JPods will work with any community to educate your children on sustainable infrastructure. JPods needs and will place factories and create jobs in communities that act in advance of consequences. JPods welcomes competitors and will actively support industry organizations that promote sustainable infrastructure. The task at hand will far exceeds all known capacities. If your community or you personally would like to help to implement sustainable infrastructure, please contact us immediately, bill.james@jpods.com. Please consider when looking at the very high rate of return on investment of JPods networks that the standard against which we compete has been stagnant, mired in regulation for 60 years. Implementing in specific niches, creating new revenue sources for cities, followed by changes forced by Global Warming and Peak Oil will shatter those obstacles. There is no obstacle to deploying 10-20 miles of JPods networks per day per installation team. This also may seem incredible but remember on April 28, 1869 a crew from the Central Pacific layed 10 miles of heavy rail between sunrise and sunset. The long installation time of current infrastructure is a decision, not a requirement.